Stays soft until you bake it. Great for school and art projects. 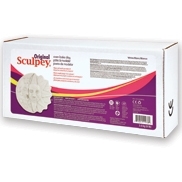 The ultimate sculpting compound Used by movie studios and professionals worldwide. A favorite with doll makers. Available in 1-lb boxes and 8-lb bulk packs. 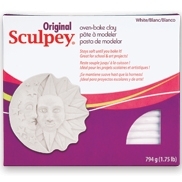 In color, Super Sculpey is a translucent pink-beige only. Easy to condition, requiring minimal hand kneading or rolling through a pasta machine to prepare for use. 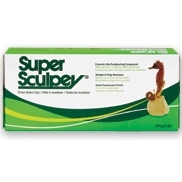 Features fine tooling and detailing characteristics, and does not fill in after tooling. Bakes to a ceramic-like hardness and can be sanded to a fine smoothness. Basic Instructions: Start with clean hands and work area. Knead clay until soft and smooth. Shape clay. Pieces thicker than 1/2" may need "bulking out" with crumpled aluminum foil and/or armature wire. Bake on oven-proof glass or metal surface at 130º for 15 minutes per 1/4" of thickness. Do not microwave. Do not overbake. Baking should be completed by an adult. Wash hands after use. *We do not stock these items but can order them for you. Our shipments usually arrive around 11:00 on Tuesdays and Thursdays.